An Theorien und Diskussionen über die Stadt mangelt es nicht, denn Städte dienen uns u.a. als Projektionsfläche zur Auseinandersetzung mit unserer Vergangenheit, der Gegenwart und unserer Zukunft. Diese Ausgabe 1 (2016) der Navigationen untersucht spielerische Formen dieser Auseinandersetzung in und mit der Stadt durch die sogenannten playful urban arts. The city has been discussed and theorized widely, and it continues to serve as a space in which our sense of the present, past, and future is constantly negotiated. This issue 1 (2016) of Navigationen examines new ways of engaging with cities through what are called the playful urban arts. Playful engagements with the urban environment frequently strive to create new ways of imagining and experiencing the city. In and through play, city spaces can become playgrounds that have the potential to transform people's sense of themselves as human actors in an urban network of spatially bound and socio-economically grounded actions. 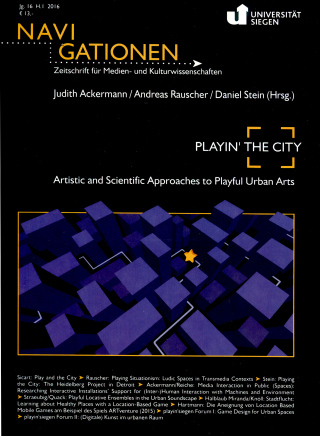 Emerging from the playin'siegen urban games festival 2015, the essays and panel discussions assembled in this issue provide an interdisciplinary account of the contemporary playful urban arts. With contributions by Miguel Sicart, Andreas Rauscher, Daniel Stein, Judith Ackermann and Martin Reiche, Michael Straeubig and Sebastian Quack, Marianne Halblaub Miranda and Martin Knöll, and Anne Lena Hartman.